Five ingredients… big, bang, boom. And this easy grilled zucchini is a simple pleasure anyone can afford and enjoy. With the brilliant advent of grill pans, non-stick or pre-seasoned cast iron, even those without a patio or with an evil, restrictive homeowners’ association can get in on some kitchen grilling action. One of the ingredients is a “luxury” item, lemon- or lime-infused olive oil, but worth investing in for salad dressing and drizzling over pretty much any vegetable, from steamed asparagus to sliced tomatoes. This recipes serves 2 people. 1. Heat grill pan or grill over medium high heat. 2. Brush olive oil on both sides of zucchini slabs. The amount depends on how large your zucchini is… if on the small side, then less. Sprinkle both sides with salt and pepper. 3. Spray cooking spray on the grill or grill pan. Place the zucchini slabs on the grill. Cook about 3-4 minutes each side or until desired doneness. I like mine a little firm still so that’s around 3 minutes each side. 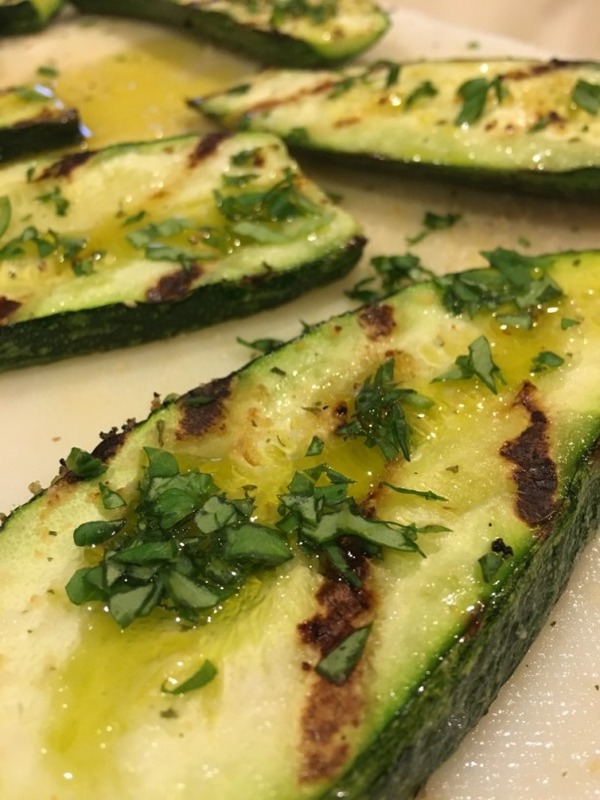 If you prefer a softer grilled zucchini, then go for 4 minutes. 4. When cooked, remove to a large plate and place zucchini in an even layer on the plate. Drizzle the lemon olive oil over the zucchini and then the fresh basil.